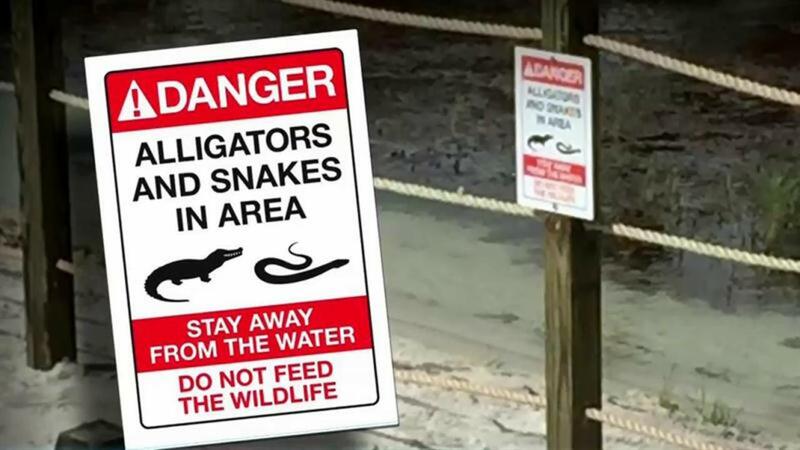 Disney is adding signs at its Florida resort warning about alligators after a 2-year-old boy was attacked and killed this week, the company said. "We are installing signage and temporary barriers at our resort beach locations and are working on permanent, long-term solutions at our beaches," Jacquee Wahler, vice president of Walt Disney resort, said in a statement Friday. The signs and barriers come three days after an alligator attacked Lane Graves as the toddler waded in between 6 inches and a foot of water in a lake near Disney's Grand Floridian Resort & Spa southwest of Orlando Tuesday. Signs at the beach where the child was attacked said no swimming was allowed but did not warn against the dangers posed by alligators. Lane's family was visiting from Nebraska, and the company has faced questions over whether it warned out-of-towners about the dangers posed by alligators. Workers were seen Friday installing fence posts on the beach at Disney where the attack occurred. Signs were added reading "Beware! There are alligators and snakes in the area" with a black silhouette of an alligator and a snake. "We continue to evaluate processes and procedures for our entire property, and, as part of this, we are reinforcing training with our cast for reporting sightings and interactions with wildlife and are expanding our communication to guests on this topic," Wahler said in the statement. Universal Studios, which is owned by NBC Universal, the parent company of NBC News, said it has begun an audit of water bodies and signage at its properties in Florida. "A large percentage of the water we have across our destination is separated from guests by natural or man-made barriers," a Universal spokesperson said. "That said, and out of an abundance of caution, we have begun an audit of all our water bodies and signage." Trappers have captured and killed at least five alligators since Tuesday's attack in hopes of finding the alligator that killed Lane, but a determination has not been made as to whether they have caught the animal responsible. The child's body was found in about 6 feet of water Wednesday, a day after the attack. The medical examiner ruled the cause the death as drowning and traumatic injuries. The Lane family issued a statement through the Orange County Sheriff's Office Thursday asking for privacy. "Words cannot describe the shock and grief our family is experiencing over the loss of our son," the statement said. "We are devastated and ask for privacy during this extremely difficult time. To all of the local authorities and staff who worked tirelessly these past 24 hours, we express our deepest gratitude."